The gospel for this Sunday indicated to me what it means to be humble in front of God who is compassionate and merciful. And, at the same time, the gospel teaches me the lesson of courage, faith, and sacrifice that gives hope and newness of life. 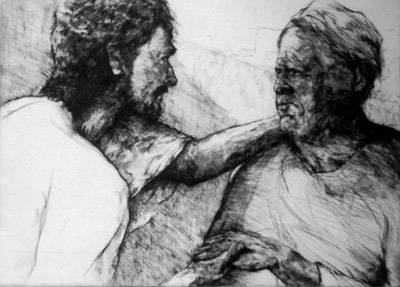 As I reflected upon the gospel for today, it challenges me somehow to imitate what the leper had shown to Jesus which made Jesus moved with pity. Humility, Courage, Faith, and Sacrifice-four important virtues that is very significant into my life as I really tried to do my best to be always near in Jesus’ heart. But, the question is; do I really put these four important virtues in practice? Do I value them and consider them as exquisite? This is always my alibi when I encounter important lessons and learnings into my life; it’s easy to say than to do. But, as I encounter the boldness of the leper in front of Jesus on the gospel, I was challenged to do the same. If I really want to be ‘healed’ and to attain newness in life, I must not be afraid to humble myself in front of Him, to be courageous in showing to Him that I need him, to have faith in Him that He will never abandon me if I believe in Him, and to sacrifice my pride for the sake of change and transformation. Hence, the invitation of the gospel for me today is to turn always to Him in time of trouble ready to humble myself, courageous in facing Him with love, faithful to His promise that He is the fulfillment, and ready to sacrifice something even my wants and desires in life. By doing these, being filled with the joy of salvation is a possibility. From the start, God never failed us to grant His compassion and mercy from us if we will only believe in His profound assurance; I do will it. Be made clean.